Saturday Review Highlights - for me! This week all the reviews that I came across and LOVED happened to be children's books. First up, Bookie Wookie reviewed Through the Animal's Eyes.. It sounds awesome. I would assume it IS awesome too since they don't make a habit of reviewing books that they don't like over there. I've started checking out some of their recommendations and have been quite pleased so I feel like I NEED this book for our family Christmas reads next year. NEED it. Yes. I do. Really. In a similar vein, Becky at Young Readers reviewed Hurry! Hurry! Have You Heard? She had some issues with the book but overall I think my two year old (upcoming three year old) would probably get a kick out of it. I'd be interested in that one also. 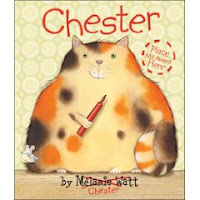 Jennifer reviewed Chester and Chester's Back over at 5 Minutes for Books and I think those books look totally cute. I love the storyline idea of having a cat try to take over Watts' writing. These books look like real winners. Has anyone else read them? I'm curious to look into those. But wait! One more before I go. Lastly, jama rattigan reviewed Christmas Farm which looks both whimsical and informative. We live in an area where there are a lot of Christmas tree farms and I think this book would be a useful tool to understanding our region a bit better. Plus it just looks like it's a good book to add to our Christmas reading celebration. (Heh. My husband just has to love this . . . ) I love how jama rattigan reviews children's books. She always provides a lot of information about the books which is so helpful in deciding whether or not you'd be interested in them. She wins again with this one and I look forward to reading it to my own kids! Ok, now I'm done. For this week. I hope everyone had a very merry Christmas and I'm looking forward to reading along with many of you in 2009!